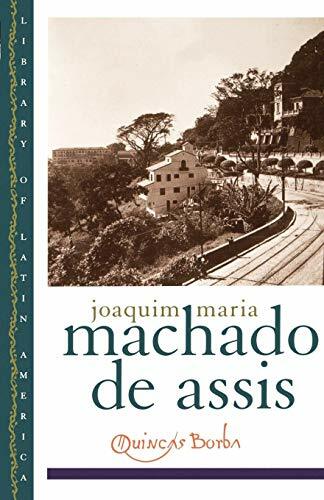 Amazon.com description: Product Description: Along with The Posthumous Memoirs of BrÃ¡s Cubas and Dom Casmurro, Quincas Borba is one of Machado de Assis' major works and indeed one of the major works of nineteenth century fiction. With his uncannily postmodern sensibility, his delicious wit, and his keen insight into the political and social complexities of the Brazilian Empire, Machado opens a fascinating world to English speaking readers. When the mad philosopher Quincas Borba dies, he leaves to his friend RubiÃ£o the entirety of his wealth and property, with a single stipulation: RubiÃ£o must take care of Quincas Borba's dog, who is also named Quincas Borba, and who may indeed have assumed the soul of the dead philosopher. Flush with his newfound wealth, RubiÃ£o heads for Rio de Janeiro and plunges headlong into a world where fantasy and reality become increasingly difficult to keep separate. Brilliantly translated by Gregory Rabassa, Quincas Borba is a masterful satire not only on life in Imperial Brazil but the human condition itself. About: Along with The Posthumous Memoirs of Brás Cubas and Dom Casmurro, Quincas Borba is one of Machado de Assis' major works and indeed one of the major works of nineteenth century fiction.